• Choose a clear, dry day to make marmalade. • Make small batches at a time to help avoid scorching. • Be certain to follow . • Properly canned, unopened marmalade should be stored in a cool, dark place up to one year. • Always refrigerate after opening and use within 6 months. • Discard marmalade at the first sign of any mold. • Use a zester, , or vegetable peeler to remove only the thin outer peel from citrus fruits. The white pith and membranes have a bitter flavor. • If you are using only the zest and fruit sections from citrus fruit, reserve the seeds and pulp, tie in cheesecloth, and cook along with the rest. The pith and seeds contain much pectin needed for gelling. • To get more juice from citrus fruits, pop them into the microwave for about 10 seconds. Let cool before rolling with slight pressure to break the tiny cells holding the juice. • The zest will be easier to remove from a whole fruit. Zest the fruit and then cut for the juice. • All fruit should be thoroughly washed before using. • Leftover zest can be sealed in a ziptop bag and frozen up to 6 months. No need to thaw before using. 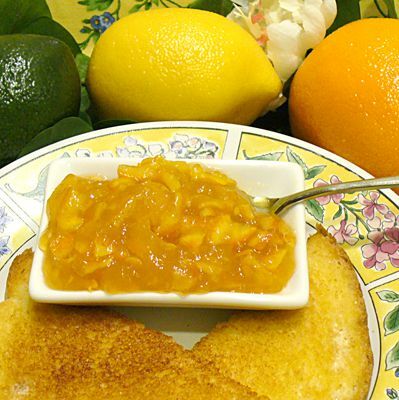 • Use marmalades in fruit butters, as a glaze for meats and vegetables, and in marinades. • Marmalade marries particularly well with salty savory condiments such as Worcestershire sauce and soy sauce. The recipe collection includes those for many different types of marmalade, as well as recipes using marmalade as a main ingredient.